Customize your bike with these custom three (3) color graphics! A unique Flame and Blade design, these graphics are manufactured with a Base, Secondary and Highlight fade color combination - all of which you select. 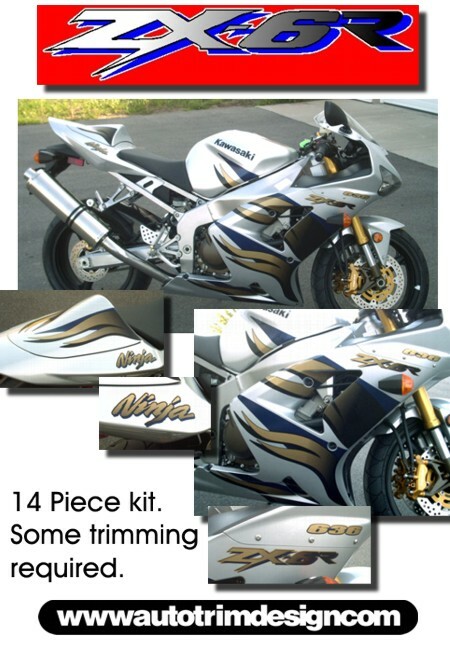 The kit comes with fourteen (14) graphic pieces which includes color matched Ninja, 636 and ZX-6R decals as shown in image. The bike shown has Gold Metallic base graphics with Reflex Blue blades and Black fades. Please Note: Premium vinyl graphics are relatively easy to install however Chrome Foil graphics may require additional assistance from your local graphics shop. Moreover, the graphic pieces will require trimming so as to conform and fit to the factory body panels. Easy to follow online instructions provided.